It was a snowy day in Foxboro, Massachusetts on December 12, 1982 as the New England Patriots hosted the Miami Dolphins. Temperatures were in the 20s with the wind gusting up to 30 mph. The artificial surface was frozen, having been soaked by rain the previous day, and now a heavy snow was falling. Snowplows and sweepers were busily employed at clearing the field during the pregame warmups and beyond. The Patriots had a 2-3 record thus far in the season that was interrupted by a 57-day players’ strike, which was as many wins as the team had compiled in going 2-14 in ‘81. The roster had been significantly overturned upon the arrival of new Head Coach Ron Meyer. QB Steve Grogan had reclaimed his starting job from Matt Cavanaugh while 30-year-old FB Mark Van Eeghen, formerly of the Raiders, joined a good group of running backs that included FB Mosi Tatupu and HB Tony Collins. Veteran PK John Smith was just returning after missing all of the season thus far due to a knee injury. Miami, in its thirteenth season under Head Coach Don Shula, was at 4-1. The ground-oriented offense was directed by QB David Woodley and included FB Andra Franklin and HB Tony Nathan. The 3-4 defense was tough up front with ends Doug Betters and Kim Bokamper and NT Bob Baumhower. Backing them up were linebackers A.J. Duhe, Bob Brudzinski, and Larry Gordon. Only 25,716 fans were in attendance at Schaefer Stadium, the smallest regular season turnout in the stadium’s history going back to 1971. The teams exchanged punts throughout the first quarter. Late in the opening period, the Patriots took possession at their 20 and mounted a long 19-play drive that extended into the second quarter. Mark van Eeghen carried twice for four yards, Steve Grogan converted third-and-six with a pass to TE Lin Dawson for seven yards, and van Eeghen ran three more times for 13 yards before Mosi Tatupu carried eight consecutive times, picking up 27 yards. But the last of those carries came on third-and-goal at the Miami one and Tatupu was stopped for no gain. John Smith came in to try for an 18-yard field goal, but the kick was partially blocked and missed the mark. The Dolphins responded with a long drive of their own. Andra Franklin (pictured at right) started off with 20 yards on two carries and David Woodley threw to TE Bruce Hardy for 12 more yards to the New England 48. Franklin and Tony Nathan ran the ball to pick up another first down and Woodley took off for 14 yards. But after Nathan gained six yards to the 18, Franklin lost a yard and Woodley was sacked by LB Clayton Weishuhn for a loss of 12 yards. Miami had to punt with 19 seconds remaining in the first half and the game remained scoreless at the intermission. The snow was still falling steadily as the clubs traded punts during the third quarter. The Dolphins again advanced into New England territory as Woodley completed two short passes and Nathan, Franklin, and HB Tommy Vigorito ran effectively. But after getting a first down at the 28, Woodley’s next three throws fell incomplete and Uwe von Schamann’s 45-yard try for a field goal was blocked and rolled into the end zone. The Patriots had the ball as the period ended and, on the first play of the fourth quarter, Grogan’s pass was intercepted by CB Gerald Small at the Miami 30, and he returned it 21 yards to the New England 49. The Dolphins were able to reach the 34 before punting. Taking possession at their own seven, the Patriots drove 77 yards in 11 plays. Van Eeghen carried for the first four and gained 25 yards. 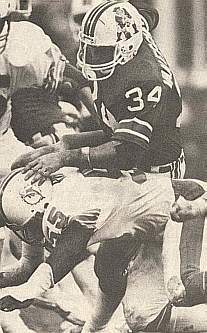 Tatupu took his place and immediately ran for 15 yards off tackle, followed by a burst through the middle in which he shook off two tackles and picked up 26 yards to the Miami 28. Three more carries by Tatupu gained 13 yards and Tony Collins then ran for two. But Collins fumbled the next handoff, and while he recovered, the play lost three yards and created a fourth-and-ten situation. 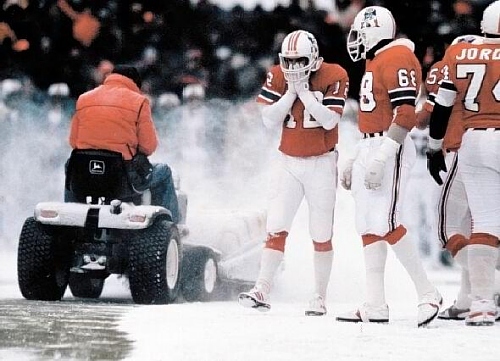 The Patriots called timeout and Coach Meyer waved one of the tractor-driven snowplows, which had been periodically used to clear the yard stripes, onto the field. Mark Henderson, a prisoner on work release who was its driver, cleared an arc that included the area from where the kick would occur (pictured at top). While some observers stated afterward that the plowing was of little consequence, whether or not that was the case Smith kicked a 33-yard field goal to finally break the scoreless tie. There was still 4:33 to go as Miami came on offense after the ensuing kickoff. Woodley immediately passed to WR Duriel Harris for 17 yards to the New England 48 and then connected with TE Joe Rose for four. Woodley picked up five yards on a quarterback draw and, on third-and-one, Franklin hit the line but a measurement showed he was inches short of a first down. Nathan dove for two yards to keep the series alive and a sideline pass by Woodley to Harris was complete for 16 yards to the 20. Franklin ran for a yard, Woodley threw an incomplete pass, and then on third-and-nine Woodley went to the air again and was intercepted by LB Don Blackmon. There were just 30 seconds remaining but the Dolphins used all three of their timeouts while Van Eeghen ran three times and the Patriots punted. There was only time for one long pass by Woodley from midfield, and it was picked off near the goal line by SS Roland James to end the game. The Patriots, thanks to the controversial field goal, came away winners by a final score of 3-0. In the slippery conditions, Miami had the edge in total yards (235 to 212) and first downs (16 to 13). 199 of New England’s yards came on the ground, to 176 for the Dolphins. The Patriots went to the air just five times and gained 13 net passing yards to Miami’s 59. The Dolphins turned the ball over twice, to one suffered by New England. Mark van Eeghen (pictured at left) rushed for 100 yards on 22 carries (his only hundred-yard performance in two seasons with New England) and Mosi Tatupu contributed 81 yards on his 13 attempts. Steve Grogan completed two of five passes for 13 yards and gave up one interception. Both completions were to Lin Dawson. For the Dolphins, David Woodley was successful on 9 of 18 throws for 76 yards and tossed the two late interceptions. 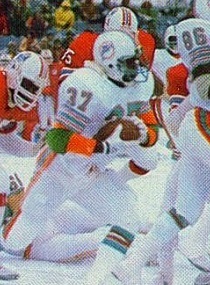 Andra Franklin gained 107 yards on 23 carries and Tony Nathan added 29 on 10 attempts in addition to two catches for 14 yards. Two other Miami receivers caught two passes apiece, with Duriel Harris gaining a team-leading 33 yards on his. “Game officials have no control over the removal of the snow done by a maintenance man with a power brush on the plow,” explained referee Bob Frederic (a situation that would be addressed in the offseason). The Patriots went on to win two of their remaining three games to finish with a 5-4 record that, in the revamped division-less format that the NFL implemented due to the strike, placed seventh in the AFC and qualified them for a spot in the resulting postseason tournament. They faced Miami, who finished second with a 7-2 tally, and the Dolphins gained a measure of revenge by winning 28-13. The Dolphins continued on to the Super Bowl, where they fell to the Washington Redskins. The NFL banned the use of snowplows on the field the next year, but the John Deere tractor which was used to clear the spot for Smith’s field goal remains on display at the Patriots Hall of Fame.